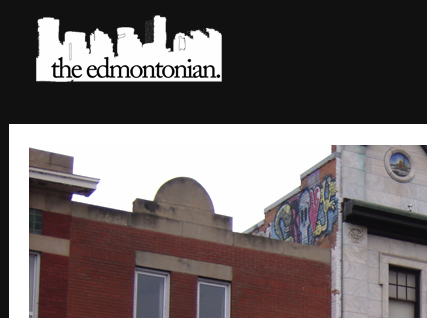 Since June 2009, Edmonton has had the benefit of a great local resource to information on just about anything you can think of — from festivals to concerts to art shows to political issues and discussions, TheEdmontonian.com launched with a mind to try and bring topics of interest to citizens in a conversational, interesting way. Jeff Samsonow and Sally Poulsen are the website’s creators. They’re the kind of people who, when you meet them for the first time, you’ll probably think to yourself that you’d really like to be friends with them, and that the best way to do that is to have them over for dinner, and oh I wonder if they’d like a course involving butternut squash. Both Jeff and Sally are hyper-intelligent individuals with media backgrounds who decided to try and enrich the place they’ve chosen to live. They both also have killer senses of humour. That’s where TheEdmontonian.com comes in. Scott and I sat down with Jeff and Sally to talk about why they started the website, some of the challenges they’ve had to deal with since its inception (hilariously enough, it launch in the same month as the Unknown Studio. So, we’re like internet brethren), and where they hope the website goes. We had a blast talking with Jeff and Sally, and I’m hoping they’ll come to subsequent recordings of the show, since Scott and I are always looking for great conversation, and more content for our blooper reel. Other things we learned about Jeff and Sally: Jeff must screen movies for Sally before she watches them in case they’re too scary or upsetting; they met in Winnipeg, though neither one of them is from there; they both have razor-sharp wits.